Abdul Basset al-Saroot (alt. 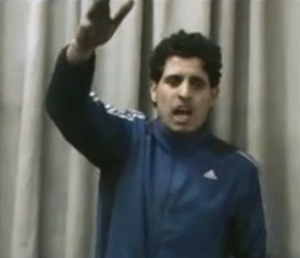 Sarout, Arabic: الساروت) is a former Syrian soccer star-turned opposition activist-militant, based in Homs, operational from at least early 2012, with the Free Syrian Army from its start in Homs, and among the last fighters to leave in May, 2014, with amnesty in a brokered deal. About two weeks after the segment's airing, respected Middle East commentator Hala Jaber said on her Twitter page Dec. 27 "Abdel Baset al-Sarout ... star in @60Minutes Inside Homs … has joined #Isis." 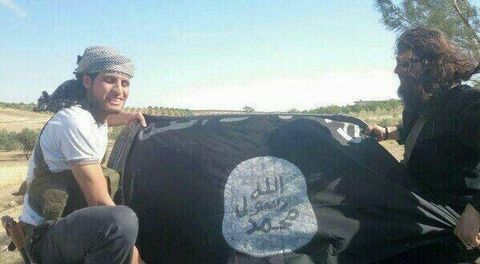 She bases the claim on the image inset at right of a guy looking just like him smilig while helping display a Daesh (ISIS/ISIL) flag. One comment notes that the photo is unconfirmed, and the photo is from a "similar story" eight months ago. If so, a pre-planned rebuttal seems likely considering the new promotion in light of this known allegation. FSA Terrorists Threatened to Fire at UN Aid Convoy Over a Week Prior to Attack Eretz Zen, Feb. 9 2014. Al-Sarout blames Assad and his supporters in "Geneva" for the siege, says they don't want just food brought in to "humiliate" them, but only "freedom." He says "we came here to die with honor and pride," and asks for a civilian safe passage out (for others?) Therefore, "I swear to Allah if the humanitarian aid is brought in without breaking the siege, we will fire at them." A week later food and aid was brought in to the old city, and more civilians were to be evacuated, in a corridor through the siege lines that remained in place. The UN truck was fired at with mortars and shot in the windshield with no injuries mentioned. Activists blamed the government. A Syrian Arab Red Crescent spokesman blamed "parties" and emphasized to Al-Jazeera that "parties" should not do that. This page was last edited on 7 January 2015, at 12:12.